• At All day: Light vehicle sales for October. The consensus is for 17.0 million SAAR in October, down from the BEA estimate of 17.36 million SAAR in September 2018 (Seasonally Adjusted Annual Rate). Fannie Mae reported that the Single-Family Serious Delinquency rate was unchanged at 0.82% in September, from 0.82% in August. The serious delinquency rate is down from 1.01% in September 2017. This ties last month as the lowest serious delinquency for Fannie Mae since September 2007. By vintage, for loans made in 2004 or earlier (3% of portfolio), 2.77% are seriously delinquent. For loans made in 2005 through 2008 (5% of portfolio), 4.90% are seriously delinquent, For recent loans, originated in 2009 through 2018 (92% of portfolio), only 0.34% are seriously delinquent. So Fannie is still working through poor performing loans from the bubble years. 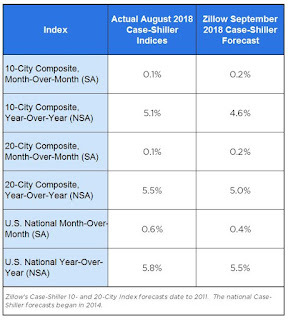 The Case-Shiller home price index climbed 5.8 percent in August from a year earlier, marking the first time in 12 months that home price gains have dropped below 6 percent. It’s more welcome news for would-be home buyers, who must be breathing a collective sigh of relief that home price growth finally has slowed. Softening appreciation after the rapid growth of just a few months earlier is a sign that fierce competition is dying down. Potential buyers who were intimidated during the heat of the market may find the breathing space now to make a calm, considered decision about whether to lock in a mortgage before rates rise further. 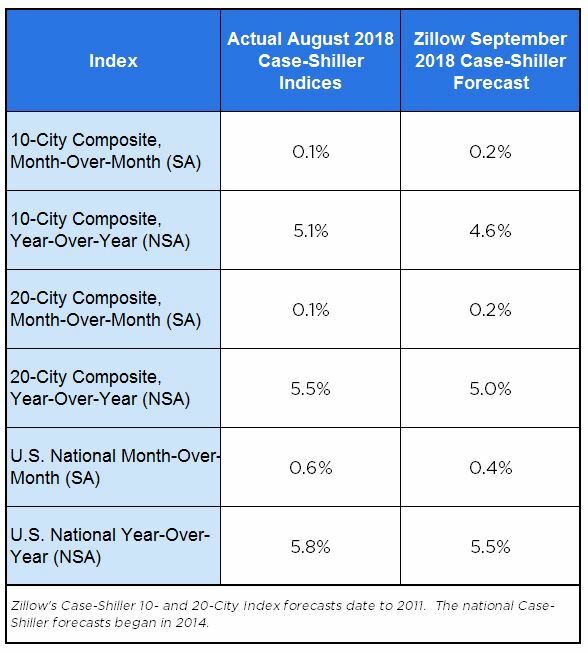 Zillow forecasts an even slower 5.5 percent annual gain for September. The MNI Chicago Business Barometer declined to 58.4 in October, the lowest reading since April, down 2.0 points from 60.4 in September. Business activity continued to expand at a healthy rate this month, despite the pace of activity decelerating for the third month in a row. A decline in order book growth and unfinished orders more than offset a rise in output, delivery times and employment, sending the Barometer to its lowest reading in six months. On the year, the Barometer was down 10.7%, the biggest year-over-year fall since December 2015. Hiring activity intensified this month, with the Employment indicator up for the first time since July. Firms continued to report ongoing difficulties recruiting both skilled and unskilled workers, while others prioritized retention of their existing workforce. “The MNI Chicago Business Barometer continued to revert back towards trend-levels in October, cooling off after a hot and unsustainable run last year,” said Jamie Satchi, Economist at MNI Indicators. “Production continues to be restrained by issues between firms and their suppliers, reflected by Supplier Deliveries at a 14-year high, while the latest raft of tariffs on Chinese goods appears to be exacerbating uncertainty across firms,” he added. This was below the consensus forecast of 60.0, but still a decent reading. Mortgage applications decreased 2.5 percent from one week earlier, according to data from the Mortgage Bankers Association’s (MBA) Weekly Mortgage Applications Survey for the week ending October 26, 2018. The average contract interest rate for 30-year fixed-rate mortgages with conforming loan balances ($453,100 or less) remained unchanged at 5.11 percent, with points decreasing to 0.50 from 0.52 (including the origination fee) for 80 percent loan-to-value ratio (LTV) loans. According to the MBA, purchase activity is down 0.4% year-over-year. • At 8:15 AM, The ADP Employment Report for October. This report is for private payrolls only (no government). The consensus is for 180,000 jobs added, down from 230,000 in September. • At 9:45 AM, Chicago Purchasing Managers Index for October. The consensus is for a reading of 60.0, down from 60.4 in September. • Bay Area home sales declined by 20 percent year over year in September, with all counties posting drops, led by Sonoma and Contra Costa. In 2018, the region’s housing market activity is trending 4 percent lower year to date. • Bay Area inventory increased by 14 percent year over year in September — about 2,000 more homes — with Santa Clara County contributing more than 50 percent to the total increase. • While appreciation has slowed from its spring peaks, Bay Area home prices are still up by 10 percent on an annual basis. San Mateo County maintained the strongest price growth at 19 percent. • The rebalancing between buyers and sellers is driven by affordability constrains and buyer fatigue, with the biggest change seen in relatively affordable and previously fiercely competitive markets. This graph shows the month-to-month change in the NSA Case-Shiller National index since 1987 (through August 2018). The seasonal pattern was smaller back in the '90s and early '00s, and increased once the bubble burst. The Census Bureau released the Residential Vacancies and Homeownership report for Q3 2018. The Red dots are the decennial Census homeownership rates for April 1st 1990, 2000 and 2010. The HVS homeownership rate increased to 64.4% in Q3, from 64.3% in Q2. I'd put more weight on the decennial Census numbers - given changing demographics, the homeownership rate has bottomed. The rental vacancy rate increased to 7.1% in Q3. The S&P CoreLogic Case-Shiller U.S. National Home Price NSA Index, covering all nine U.S. census divisions, reported a 5.8% annual gain in August, down from 6.0% in the previous month. The 10-City Composite annual increase came in at 5.1%, down from 5.5% in the previous month. The 20-City Composite posted a 5.5% year-over-year gain, down from 5.9% in the previous month. “Following reports that home sales are flat to down, price gains are beginning to moderate,” says David M. Blitzer, Managing Director and Chairman of the Index Committee at S&P Dow Jones Indices. “Comparing prices to their levels a year earlier, 14 of the 20 cities, the National Index plus the 10-city and 20-city Composite Indices all show slower price growth. The seasonally adjusted monthly data show that 10 cities experienced declining prices. Other housing data tell a similar story: prices and sales of new single family homes are weakening, housing starts are mixed and residential fixed investment is down in the last three quarters. Rising prices may be pricing some potential home buyers out of the market, especially when combined with mortgage rates approaching 5% for 30-year fixed rate loans. The Composite 10 index is off 0.8% from the bubble peak, and up 0.1% in August (SA). The Composite 20 index is 2.4% above the bubble peak, and up 0.1% (SA) in August. The National index is 10.4% above the bubble peak (SA), and up 0.6% (SA) in August. The National index is up 49.3% from the post-bubble low set in December 2011 (SA). The Composite 10 SA is up 5.1% compared to August 2017. The Composite 20 SA is up 5.5% year-over-year. • At 9:00 AM ET, S&P/Case-Shiller House Price Index for August. The consensus is for a 6.0% year-over-year increase in the Comp 20 index for August. • At 10:00 AM, the Q3 2018 Housing Vacancies and Homeownership from the Census Bureau. Earlier I posted a graph showing real monthly personal consumption expenditures (PCE) based on the monthly BEA report. In September, the YoY change was 3.0%, about the same level as for the last few years. There was a significant decline in real PCE during the great recession, and real PCE was fairly weak during the first few years of the recovery - partially due to the ongoing weakness in housing following the housing bubble and bust. More recently real PCE has been increasing at a fairly steady rate around 3.0% per year. The BEA has released the underlying details for the Q3 advance GDP report. The BEA reported that investment in non-residential structures decreased at a 7.9% annual pace in Q3. Investment in petroleum and natural gas exploration decreased slightly in Q3 compared to Q2, but has increased substantially recently. Without the increase in petroleum and natural gas exploration, non-residential investment would only be up about 4% year-over-year. Investment in offices increased in Q3, and is up 10% year-over-year. Investment in multimerchandise shopping structures (malls) peaked in 2007 and was down about 7% year-over-year in Q3. The vacancy rate for malls is still very high, so investment will probably stay low for some time. Lodging investment increased in Q3, and lodging investment is up 7% year-over-year. Home improvement was the top category for five consecutive years following the housing bust ... but now investment in single family structures has been back on top for the last six years and will probably stay there for a long time - although single family investment has been down a little recently. However - even though investment in single family structures has increased from the bottom - single family investment is still very low, and still below the bottom for previous recessions as a percent of GDP. I expect some further increase. Investment in single family structures was $286 billion (SAAR) (about 1.4% of GDP), and was down slightly in Q3 compared to Q2. Investment in multi-family structures decreased in Q3. Investment in home improvement was at a $264 billion Seasonally Adjusted Annual Rate (SAAR) in Q3 (about 1.3% of GDP). Home improvement spending has been solid. Price increases accelerated further in October, and wage pressures remained elevated. Based on these regional surveys, it seems likely the ISM manufacturing index will be solid in October, but below 60 again (to be released on Thursday, November 1st). Real DPI increased 0.1 percent in September and Real PCE increased 0.3 percent. The PCE price index increased 0.1 percent. Excluding food and energy, the PCE price index increased 0.2 percent. The September PCE price index increased 2.0 percent year-over-year and the September PCE price index, excluding food and energy, also increased 2.0 percent year-over-year. The following graph shows real Personal Consumption Expenditures (PCE) through September 2018 (2012 dollars). Note that the y-axis doesn't start at zero to better show the change. PCE growth was strong in Q3, and inflation is close to the Fed's target. • At 8:30 AM ET, Personal Income and Outlays for September. The consensus is for a 0.4% increase in personal income, and for a 0.4% increase in personal spending. And for the Core PCE price index to increase 0.1%. • At 10:30 AM, Dallas Fed Survey of Manufacturing Activity for October. This is the last of the regional Fed manufacturing surveys for October. From CNBC: Pre-Market Data and Bloomberg futures: S&P 500 are up 18 and DOW futures are up 144 (fair value). Oil prices were down over the last week with WTI futures at $67.69 per barrel and Brent at $77.79 per barrel. A year ago, WTI was at $54, and Brent was at $61 - so oil prices are up about 25% year-over-year. Here is a graph from Gasbuddy.com for nationwide gasoline prices. Nationally prices are at $2.81 per gallon. A year ago prices were at $2.45 per gallon, so gasoline prices are up 36 cents per gallon year-over-year. This is the fourth strong year in a row for hotel occupancy. The occupancy rate, to date, is just ahead of the record year in 2017. Other key indicators include the October ISM manufacturing index, October auto sales, Personal Income and Outlays for September, Case-Shiller house prices for August, and the September trade deficit. For manufacturing, the Dallas Fed manufacturing survey will be released this week. 8:30 AM ET: Personal Income and Outlays for September. The consensus is for a 0.4% increase in personal income, and for a 0.4% increase in personal spending. And for the Core PCE price index to increase 0.1%. 10:30 AM: Dallas Fed Survey of Manufacturing Activity for October. This is the last of the regional Fed manufacturing surveys for October. 10:00 AM: the Q3 2018 Housing Vacancies and Homeownership from the Census Bureau. 8:15 AM: The ADP Employment Report for October. This report is for private payrolls only (no government). The consensus is for 180,000 jobs added, down from 230,000 in September. 9:45 AM: Chicago Purchasing Managers Index for October. The consensus is for a reading of 60.0, down from 60.4 in September. All day: Light vehicle sales for October. The consensus is for 17.0 million SAAR in October, down from the BEA estimate of 17.36 million SAAR in September 2018 (Seasonally Adjusted Annual Rate). 8:30 AM: The initial weekly unemployment claims report will be released. The consensus is for 212 thousand initial claims, down from 215 thousand the previous week. 10:00 AM: ISM Manufacturing Index for October. The consensus is for 59.1%, down from 59.8%. The PMI was at 59.8% in September, the employment index was at 58.8%, and the new orders index was at 61.8%. 10:00 AM: Construction Spending for September. The consensus is for 0.3% increase in spending. 8:30 AM: Employment Report for October. The consensus is for 190,000 jobs added, and for the unemployment rate to be unchanged at 3.7%. There were 134,000 jobs added in September, and the unemployment rate was at 3.7%. In September the year-over-year change was 2.537 million jobs. The consensus is the trade deficit to be $53.4 billion. The U.S. trade deficit was at $53.2 billion in August. Here is the unofficial problem bank list for October 2018. Update on the Unofficial Problem Bank List for October 2018. The list had a net decline of four insured institutions to 75 banks after six removals and two additions. Aggregate assets declined during the month by $772 million to $56.2 billion. A year ago, the list held 111 institutions with assets of $26.6 billion. Actions were terminated against First Chatham Bank, Savannah, GA ($369 million); Bank of Eastman, Eastman, GA ($170 million); Pinnacle Bank, Orange City, FL ($89 million); and American Investors Bank and Mortgage, Eden Prairie, MN ($69 million). Removals through other ways include Sage Bank, Lowell, MA ($143 million) finding a merger partner and Merchants Bank of California, National Association, Carson, CA ($3 million) exiting through a voluntary liquidation. Additions this month were AllNations Bank, Calumet, OK ($51 million) and Sainte Marie State Bank, Sainte Marie, IL ($20 million). Lastly, we updated the name of Illinois-Service Federal Savings and Loan Association, Chicago, IL ($133 million) to GN Bank. The Federal Reserve Bank of Philadelphia has released the coincident indexes for the 50 states for September 2018. Over the past three months, the indexes increased in 44 states, decreased in five states, and remained stable in one, for a three month diffusion index of 78. In the past month, the indexes increased in 39 states, decreased in six states, and remained stable in five, for a one-month diffusion index of 66. In September, 40 states had increasing activity (including minor increases). This is the fewest states with increasing activity in almost 9 years. Residential investment (RI) decreased in Q3 (-4.0% annual rate in Q3). Equipment investment increased slightly at a 0.4% annual rate, and investment in non-residential structures decreased at a 7.9% annual rate. On a 3 quarter trailing average basis, RI (red) is down slightly, equipment (green) is positive, and nonresidential structures (blue) is also up. Recently RI has been soft, but the decrease is fairly small. Residential Investment as a percent of GDP decreased in Q3, however RI has generally been increasing. RI as a percent of GDP is only just above the bottom of the previous recessions - and I expect RI to continue to increase further in this cycle. The third graph shows non-residential investment in structures, equipment and "intellectual property products". Investment in equipment and non-residential structures - as a percent of GDP - declined. • At 8:30 AM ET, Gross Domestic Product, 3nd quarter 2018 (Advance estimate). The consensus is that real GDP increased 3.3% annualized in Q3, down from 4.2% in Q2. • At 10:00 AM, University of Michigan's Consumer sentiment index (Final for October). The consensus is for a reading of 99.0. Freddie Mac reported that the Single-Family serious delinquency rate in September was 0.73%, unchanged from 0.73% in August. Freddie's rate is down from 0.86% in September 2017. This ties the lowest serious delinquency rate for Freddie Mac since January 2008. The increase in the delinquency rate late last year was due to the hurricanes (These are serious delinquencies, so it took three months late to be counted). We will probably see another, smaller, bump following hurricanes Florence and Michael. The Federal Reserve Bank of Kansas City released the October Manufacturing Survey today. According to Chad Wilkerson, vice president and economist at the Federal Reserve Bank of Kansas City, the survey revealed that Tenth District manufacturing activity continued to expand, but at a slower pace. Expectations for future activity eased slightly, but remained positive. “While regional factories reported another month of growth, a number of firms engaged in international trade noted negative effects of tariffs on supply chains,” said Wilkerson. The month-over-month composite index was 8 in October, down from 13 in September and 14 in August. The composite index is an average of the production, new orders, employment, supplier delivery time, and raw materials inventory indexes. The decline in factory growth was driven by slower expansion at durable goods plants, especially for machinery, computer and electronic products, and transportation equipment, while activity at nondurable goods plants increased. Month-over-month indexes were mixed in September, but positive overall. The production and new orders indexes declined slightly, while the order backlog and new orders for exports indexes inched up. The shipments and employment indexes both increased. The materials inventory index declined and the finished goods inventory index was unchanged from last month’s reading. This is the lowest level for this index since 2016. The regional surveys for October have mostly indicated slower growth in October as compared to September, and these surveys suggest the ISM index will still be solid, but could be close to the lowest level this year. The Pending Home Sales Index, a forward-looking indicator based on contract signings, increased 0.5 percent to 104.6 in September from 104.1 in August. However, year-over-year, contract signings dropped 1.0 percent make this the ninth straight month of annual decreases. The PHSI in the Northeast dropped 0.4 percent to 92.3 in September, and is now 2.7 percent below a year ago. In the Midwest, the index rose 1.2 percent to 102.4 in September and is 1.1 percent lower than September 2017. Pending home sales in the South fell 1.4 percent to an index of 119.6 in September; however, that is 3.3 percent higher than a year ago. The index in the West increased 4.5 percent in September to 93.1 and plunged 7.4 percent below a year ago. This was above expectations for this index. Note: Contract signings usually lead sales by about 45 to 60 days, so this would usually be for closed sales in October and November. The dashed line on the graph is the current 4-week average. The four-week average of weekly unemployment claims was unchanged at 211,750. • At 8:30 AM ET, The initial weekly unemployment claims report will be released. The consensus is for 212 thousand initial claims, up from 210 thousand the previous week. • Also at 8:30 AM, Durable Goods Orders for September from the Census Bureau. The consensus is for a 1.4% decrease in durable goods orders. • At 10:00 AM, Pending Home Sales Index for September. The consensus is for no change in the index. • At 11:00 AM, the Kansas City Fed manufacturing survey for October. Following the weak new home sales report, I'd like to update a couple of graphs. Since I wrote that post, new home sales and housing starts have weakened. RI as a percent of GDP has been sluggish recently, mostly due to softness in multi-family residential. And it is too early to say that single family housing starts and new home sales have turned down. Although new home sales were down sharply in September, the decline isn't that large historically (at least not yet). Fed's Beige Book "This report was prepared at the Federal Reserve Bank of Richmond based on information collected on or before October 15, 2018. " Economic activity expanded across the United States, with the majority of Federal Reserve Districts reporting modest to moderate growth. New York and St. Louis indicated slight growth, overall, while Dallas reported robust growth driven by strong manufacturing, retail, and nonfinancial services activity. On balance, manufacturers reported moderate output growth; however, several Districts indicated that firms faced rising materials and shipping costs, uncertainties over the trade environment, and/or difficulties finding qualified workers. Demand for transportation services remained strong. Labor shortages were broadly noted and were linked to wage increases and/or constrained growth. Reports on commercial and residential real estate were mixed, although several Districts saw rising home prices and low levels of inventory. Single-family home sales were steady to down modestly in the suburbs around New York, including northern New Jersey. One contact ascribed some of this weakness to changes in federal tax law that limit deductibility of homeowner costs. New home sales for September were reported at 533,000 on a seasonally adjusted annual rate basis (SAAR). This was well below the consensus forecast, and the three previous months were revised down significantly. A very weak report. Sales in September were down 13.2% year-over-year compared to September 2017. This was a large YoY decline, although some of the decline might be related to the impact of the hurricanes. However the largest declines were in the North East and the West, and those declines were not hurricane related. It is not time to panic - or start looking for a recession - but this was a very weak report. Earlier: New Home Sales decrease sharply to 553,000 Annual Rate in September. New home sales had been up year-over-year every month this year prior to this report. Not only were sales down YoY in September, but with revisions, sales were down slightly YoY in June too. Sales are only up 3.5% through September compared to the same period in 2017. This is below my forecast for 2018 for an increase of about 6% over 2017. As I noted early this year, there were downside risks to that forecast, primarily higher mortgage rates, but also higher costs (labor and material), the impact of the new tax law, and other possible policy errors. Also new home sales had a strong Q4 2017, so the comparisons will be more difficult - and sales might even be down for the year. The "distressing gap" graph shows existing home sales (left axis) and new home sales (right axis) through September 2018. This graph starts in 1994, but the relationship had been fairly steady back to the '60s. AIA’s Architecture Billings Index (ABI) score for September was 51.1 compared to 54.2 in August. However, continued strength in new projects coming into architecture firms points to billings growth in the coming months. This graph shows the Architecture Billings Index since 1996. The index was at 51.1 in September, down from 54.2 in August. Anything above 50 indicates expansion in demand for architects' services. The Census Bureau reports New Home Sales in September were at a seasonally adjusted annual rate (SAAR) of 553 thousand. The previous three months were revised down significantly. "Sales of new single‐family houses in September 2018 were at a seasonally adjusted annual rate of 553,000, according to estimates released jointly today by the U.S. Census Bureau and the Department of Housing and Urban Development. This is 5.5 percent below the revised August rate of 585,000 and is 13.2 percent below the September 2017 estimate of 637,000." The months of supply decreased in September to 7.1 months from 6.5 months in August. "The seasonally‐adjusted estimate of new houses for sale at the end of September was 327,000. This represents a supply of 7.1 months at the current sales rate." In September 2018 (red column), 41 thousand new homes were sold (NSA). Last year, 50 thousand homes were sold in September. This was well below expectations of 625,000 sales SAAR, and the previous months were revised down significantly. I'll have more later today. According to Black Knight's First Look report for September, the percent of loans delinquent increased 13.2% in September compared to August, but decreased 9.8% year-over-year. The percent of loans in the foreclosure process decreased 4.5% in September and were down 26.0% over the last year. Black Knight reported the U.S. mortgage delinquency rate (loans 30 or more days past due, but not in foreclosure) was 3.97% in September, up from 3.52% in August. The percent of loans in the foreclosure process decreased in September to 0.52% from 0.54% in August. The number of delinquent properties, but not in foreclosure, is down 196,000 properties year-over-year, and the number of properties in the foreclosure process is down 90,000 properties year-over-year. Mortgage applications rose 4.9 percent from one week earlier, according to data from the Mortgage Bankers Association’s (MBA) Weekly Mortgage Applications Survey for the week ending October 19, 2018. The previous week’s results did not include an adjustment for the Columbus Day holiday. The average contract interest rate for 30-year fixed-rate mortgages with conforming loan balances ($453,100 or less) increased to its highest level since February 2011, 5.11 percent from 5.10 percent, with points decreasing to 0.52 from 0.55 (including the origination fee) for 80 percent loan-to-value ratio (LTV) loans. The effective rate increased from last week. • At 9:00 AM, FHFA House Price Index for August 2018. This was originally a GSE only repeat sales, however there is also an expanded index. • At 10:00 AM, New Home Sales for September from the Census Bureau. The consensus is for 625 thousand SAAR, down from 629 thousand in August. "Mortgage Rates Barely Budge Despite Market Volatility"
Here is a graph I haven't updated in some time. From the Census Bureau "Started and Completed by Purpose of Construction" through Q2 2018. Single family starts built for sale were up about 8% in Q2 2018 compared to Q2 2017. Owner built starts were unchanged year-over-year. And condos built for sale not far above the record low, but up 11% compared to Q2 2017. The 'units built for rent' (blue) had increased significantly following the great recession, but are now moving mostly sideways.